How much is this arctic blast costing your business? The lingering cold snap continues to add to NH businesses' heating and electricity expenses. Independent grid operator ISO-New England says oil-burning power plants are running short of fuel. 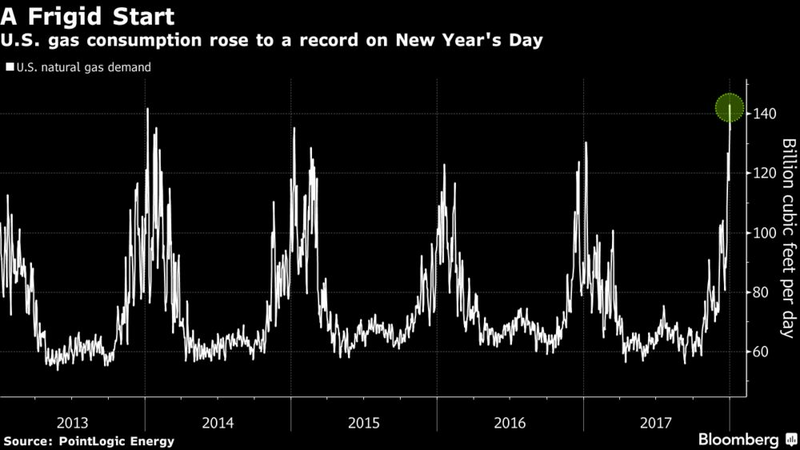 Bloomberg reports natural gas consumption broke records on New Years Day, after spot prices in New England last week were the highest in the world. Wish you had more control over your own energy costs? With no relief from this cold predicted until mid-January, don't you wish you had taken steps to control your own energy expenses? The BIA Energy Program, powered by Usource, offers a full range of integrated energy solutions for businesses to mitigate risk and manage costs year-round. Reach out to their advisors today. Mingle with NH lawmakers and tell them your business concerns face-to-face. Register for BIA's Welcome Back Legislators on Jan 11 from 4-6 pm at the Concord Holiday Inn. Invited guests include Senate President Morse, House Speaker Chandler, Senate Majority Leader Bradley, Senate Democratic Leader Woodburn, and House Democratic Leader Shurtleff. Looking to build employee skills in areas like quality control, safety, or management? The NH Job Training Fund is a $1m matching grant program to enhance worker competencies and improve NH's economic development. Grants are awarded monthly and range from $750 to $100,000. Click to learn how to take advantage of this resource. Make us a part of your 2018 marketing plan. BIA publications are seen by 4,000 important NH business leaders and decision makers. Learn more about these opportunities. As an exclusive benefit to BIA members, businesses can list any job postings for free in E-brief. Contact Kevin Flynn if you have positions you're looking to fill. See our current listings in Membership News. As a member of BIA, you already know many of the great benefits of being part of the statewide chamber of commerce. But did you know how active BIA is at the State House advocating on issues of importance to the business community? Listen to Gerardine Ferlins of Cirtronics explain how BIA covers the spectrum of business-related issues. Help take the sting out of prescription costs for your employees with BIA's free NH Rx Card. If they print, email, or download their copy at CardForNH.com, they can get significant discounts at over 68,000 drug stores. Savings average 30-70%. Everyone is pre-approved. Who in your office requires continuing education or professional development credits? Project managers, HR managers, accountants, and others. BIA's E-learning Accelerator allows them to work online at their own pace to get the credits needed for licensing or certification. There are over 130 affordable courses in 16 content areas to choose from. Monthly policy committee meetings are held at the BIA office, 122 North Main Street in Concord. To join a committee, log in to the Members Only section of our website and click Join a Committee. If you do not have login credentials, please contact us at 224.5388 x100 or by email. BIA is pleased to help our members promote job opportunities available within their companies. If you have open positions that you would like us to post in E-Brief for free, please email the information to Kevin Flynn. Know a business interested in membership? Submit your BIA prospect referrals online. Vice President of Membership Development Christine Ducharme can answer questions and provide information to interested businesses about the benefits of joining New Hampshire's largest, broad-based business advocacy organization. Email or call 224.5388 x113. A warm welcome to our newest BIA member firms. Please visit our New Members section to view the list of our most recent members. As part of your BIA membership, you receive a free listing in our online business directory. This can help generate referrals to your business. And, because our business directory is searchable by a number of fields, it allows potential customers to find you using a variety of search criteria. To view your business directory listing, visit the Membership Directory page on our website and type in your business name. To update your listing, log in to the Members Only portal for your organization. If you have questions, need assistance, or need to obtain your company's login information, call 603.224.5388 x100. Register now. Jan 11, 4:00-6:00 pm. Holiday Inn, Concord. Feb 9, 7:30 am – 12:00 pm. Holiday Inn, Concord.